While we are most permanently affected by greater things, we are most presently and persistently affected by lesser things. Sometimes it is the lesser things that irritate us the most, for example, fleas and chiggers. Chiggers are so small that we usually can't see them. Yet, they leave a bite that can annoy us for days. Similarly, fleas are remembered, long after they hop away, because of all the itching they cause. Yet, most people give very little thought to the safety of their souls. Perhaps they are touched when the gospel and warning of coming judgment are clearly presented. However, as soon as church is dismissed the warning is often forgotten. It remains forgotten, because there is no itch to remind them. Instead, the details and concerns of daily living serve as a deadly balm, smothering any irritation the message caused. The warning, instead of pointing them to Christ, gets stiffled by lesser things. Even for the Christian, the hope we have in Christ is often undervalued. It, too, doesn't attract attention by making us itch. The joy of our salvation is drowned out in the details of living, and our love, gratitude towards God, and hope get diluted by excess affection for temporal things. Failure to appreciate our salvation makes us especially vulnerable when we experience a dark providence, for example, the loss of an only child. Confidence that Steve was a Christian. Unexplainable comfort and strength from God and His church. Yet, eight months later I find myself grieving because of what, comparatively, is a little thing. Last night, on the way home from work, I passed a couple of yards where boys had left their bicycles lying in the grass. This reminded me so much of Steve that I wept. 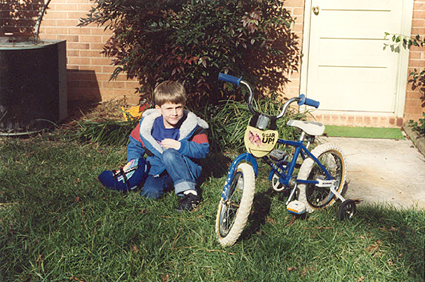 The attachment of Steve to bicycles runs deep in my fondest memories. I recall, several years ago, driving up to our house in Tallahassee and seeing Steve's bright red bicycle parked in front of the porch. It was the most beautiful sight in the world, and I remember reflecting on how content this made me feel. There it picturesquely represented the most precious title I owned, "Stephen's father." All that was most dear to me in this world could be summed up that single image of the little red bicycle parked in front of that house. However, today I am very sad, because I'm still thinking about those bicycles. Yet, in the context of eternal realities, this is a lesser thing. The greater thing was and is taken care of. When Steve set out to execute that final jump, his soul was safe. When he crashed and lost consciousness, he was still safe. And when he left his earthly body, the safety of his soul, previously visible only through the eyes of faith, for him became sight. I know this, but for now I have to deal with lesser things, like the constant reminders that make me miss him. I don't mean to minimize grief by calling these lesser things. Indeed, compared to most other things in our lives, the catalysts of this kind of grief and the woeful feelings they generate are gigantic things. They have the potential to crush us and to destroy our lives. However, compared to eternal things, like the safety of Stephen's soul and mine, the reminders that constantly drive me back to grief are lesser things. These are things that I need to patiently bear, things that I need to consider without losing perspective of things eternal. Jesus taught us to distinguish greater things from lesser things. That is what I need to do, now, as I continue on this journey through the valley of grief. Now for the question: "How am I supposed to do this?" Even though these are lesser things, they are strong enough to throw me into sadness. Does that mean that I'm making too much of lesser things? Does that mean that I don't place enough value on eternal things? I'm not sure, so I'm just going to pray. Dear Heavenly Father, please help me to not let my life be defined by lesser things. Help me to grab on to that hope, that because you have taken care of the greater things, I can confidently persevere through this season of grief. Increase my capacity to hope in you, and keep my heart from being so easily shaken. May it be an ever-present source of joy in my heart, even as I grieve, that it is well with my soul. Amen. For now, I observe that there is grief and there is despair. Despair is worse; it is grief without hope. The hope that I have in Christ won't take the grief away, at least in this life, but as I tenaciously cling to Jesus Christ, the only source of true and lasting comfort, it will keep me from moving into despair.